Proving yet again that you can’t invest on headlines, the S&P 500 index gained 8.0% in January—the best first month of a year for the large-cap index since 1987—despite a record-long partial U.S. government shutdown and decelerating global growth. Over the past 13 months, (covering 2018’s loss and January’s gain), the S&P 500 is up 3.3% when you include dividends. Foreign markets also gained in January, as improved sentiment on trade spread overseas. The MSCI China Index gained 11.3% and the MSCI Emerging Markets Index returned 8.8% for the month. Even a failed Brexit agreement in the U.K. didn’t put investors off. The MSCI EAFE Index, a broad measure of developed stock markets outside of the U.S., advanced 6.6% in January. Bonds started the year on a positive note as well. Yields mostly fell as the Federal Reserve signaled it was not planning to hike the fed funds rate in the near-term. The Bloomberg Barclays U.S. Treasury Index returned 0.5% in January, while the broader Bloomberg Barclays U.S. Aggregate Bond Index rose 1.1%. High-yield corporate bonds did even better, benefitting from Wall Street’s risk-on view and flows back into the asset class. The Bloomberg Barclays U.S. Corporate High Yield Index returned 4.5% for the month. There were no changes to the Dividend Income strategy in January. The portfolio’s current dividend yield is approximately 2.7% compared to 2.2% for the S&P 500 index. Based on our bottom-up stock selection, the portfolio remains overweight companies in the technology, financials, industrials and consumer staples sectors. We are monitoring this quarter’s earnings reports for any potential opportunities. After the strong January stock market rally, our Global Tactical Balanced strategy reduced its bond holdings and added to international and U.S. equities. We bought S&P 500 and convertibles ETFs, as well as ETFs targeting the consumer staples, consumer discretionary and telecom sectors. We also purchased emerging market bonds and a Russia equity ETF. Following these trades, half of the portfolio is in bonds, 45% is in U.S. equities and 5% is in international stocks. The Tactical Balanced strategy made no changes in January—half of the portfolio was in cash with the other half divided between an S&P 500 ETF and a broad investment-grade bond ETF. At the start of February, we shifted the portfolio to a more defensive posture when the month-end model, which measures trends over a longer time period than the daily ones, signaled to sell the remaining equities to buy more bonds. The portfolio is now split between U.S. bonds and cash. While equities are still in a negative long-term trend (despite January’s rebound), it is possible that a diversified set of daily models could signal a more aggressive stance for the portfolio if the rally continues. Our Tactical High Income portfolio was fully invested for the month. 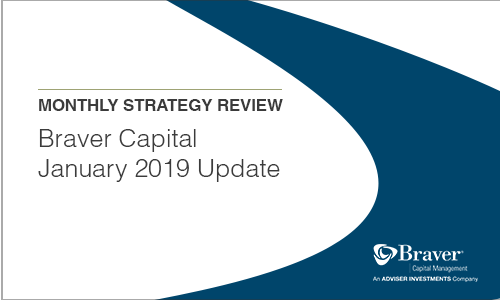 The strategy rebounded strongly in January as credit spreads tightened and investors returned to the high-yield space. High-yield bonds delivered their best month since October 2011. Tactical Opportunity’s quantitative models triggered several trades in January, significantly adding risk to the portfolio. We bought health care and financial sector ETFs as well as various value-stock ETFs. We also added to a position in an S&P 500 ETF. Investors in this strategy were 100% invested in equities at the end of the month. Market trends in January prompted only one trade in Tactical Sector Rotation—weakness in pharmaceuticals signaled a sale; it was replaced by a biotechnology ETF. While our other tactical strategies have the potential to reduce risk by trading to cash or bonds, Tactical Sector Rotation is always fully invested in the eight stock sectors or industries that show the strongest relative performance. The portfolio currently includes defensive sectors, such as consumer discretionary and health care, along with holdings in consumer staples, financials, real estate, telecom and utilities.